It’s 2:30 pm and Cesar Chavez Library in Salinas is filling up with kids. 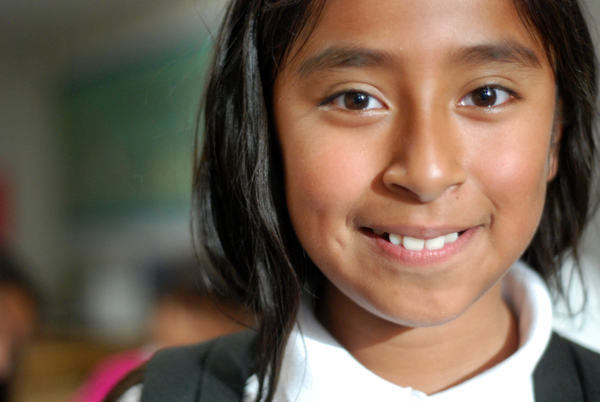 Graciela Flores taps them on the head—“40, 41, 42”—as they sign in to the homework center. Over the next two hours, about 60 Salinas schoolchildren will come to the library to work—with help from some exceptional tutors. 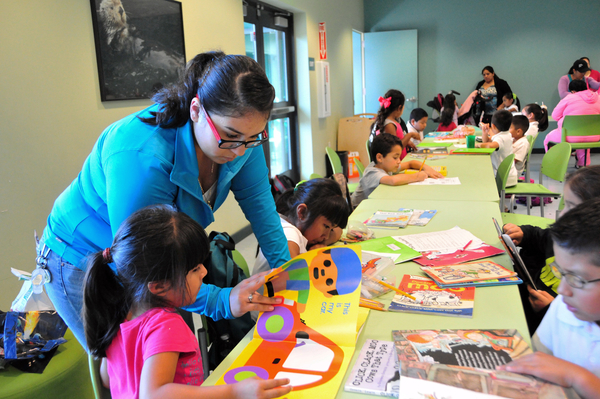 The program offers help at multiple sites, including the Chavez Library, and also at Sherwood, Los Padres, and Roosevelt Elementary Schools in East Salinas. The tutoring program makes use of one of the community’s biggest untapped assets—young people who wanted to give back. People like Marissa Flores. 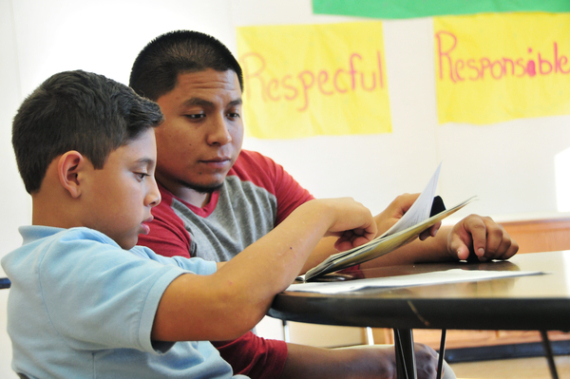 Hartnell College sophomore Stephen Corona, 24, helps Yacer Picazo, a Sherwood Elementary School student, with his English reading. She’s only half-kidding. Her mother, Graciela, has been working with kids since Marissa was little. Growing up in Patzcuaro, Mexico, Graciela had wanted to become a teacher. Instead, she came to the United States 25 years ago and worked in the fields. She also studied English at Hartnell College, volunteered at her daughter’s elementary school, and became a lunch supervisor, a tutor at the YMCA, and then the manager of the library’s tutoring center. Her younger daughter, Natalie, now a freshman at UC Davis, began tutoring as a volunteer, then a student, then as a staff member. “This is the family business,” Graciela jokes. Ernesto Lizaola also grew up in Salinas, and remembers the Chavez Library well. Now, as manager of the tutoring program for the city, he has a colorful office there, in the heart of it all. “Our tutors serve as role models for the kids taking part in the homework center,” he says with pride. “They themselves were probably at that same place where their students are now, so it’s good for them to see peers and people from their own community going to college and striving for a better future.”- Ernesto Lizaola, Community Education Manager for the City of Salinas. Tutor Marissa Flores couldn’t stay away from the library even after leaving for college; she’d help out whenever she came back for a break. When she graduated, she became part of the library’s team of 22 tutors, each working up to 25 hours a week. 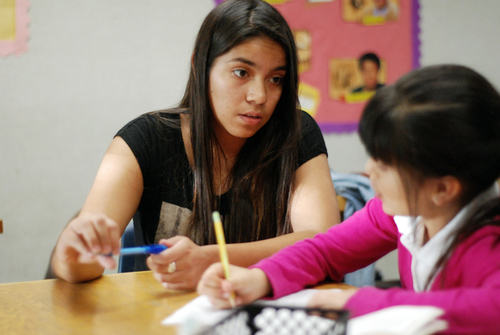 Tutor Mariana Garcia, left, works with student Miranda Escobar on her homework at the Los Padres Learning Center in Salinas. In reality, Marissa says, she worked almost full-time, putting in unpaid hours on nights and weekends and even making house calls. One year, she worked with a boy, Raul, a first-grader with ADHD whose parents spoke no English. She worked with him three hours a day, going over the alphabet and teaching him phonetics. She points across the room, where Maria Castro, a 7th-grader with a dark ponytail, is helping a boy with spelling. A few years ago, Marissa helped Maria with her first-grade homework; now she helps her learn the skills and patience needed to be a good tutor. Tutor Elizabeth Pacheco has her hands full with different homework assignments at the Cesar Chavez Library’s homework center in Salinas. In the back of the room, six-year-old Yuridia is reading “Turtle and Snake Go Camping” under the watchful gaze of Mariana Garcia, an Alisal High School graduate now attending California State University, Monterey Bay. Jesus, also six, comes over with a spelling question and Mariana show him the ‘w’ he needs to complete his word. While the tutors work with kids, Graciela Flores connects with each mother who comes to pick up her child. She reminds the kids and parents almost every day that they need to think about college. “Work hard,” she says. “Change your life. Then you can do whatever you want.” With a little help from the extended family. Esmeralda Hernandez is ready to head home after a long homework help session at the Los Padres Learning Center in Salinas. For more information about the Salinas Public Library Tutoring Program, visit www.salinaspubliclibrary.org.